Our Partnership with St. Marks allows us the wonderful opportunity to help them support their Community Food Bank/Soup Kitchen. We meet, the second Thursday of every month, in the parking lot of St. David’s at 9:00 am and car pool to St. Mark’s. Our return is approximately 5:00 pm. Please contact Carol Rodgers (carol@deloreanmorotcar.com) or John Patterson (jihpatterson@gmail.com) if you are able to volunteer. Bring in your old cell phones, they will be donated to Womanspace and re-programmed for 911 calls only. St. David’s October Outreach project has traditionally been Church World Service’s CROP Walk, which is sponsored locally by the Windsor-Hightstown Area Ministerium. J2A members participate in the walk and ask for sponsors from the parish; however, anyone is welcome to take part in the walk and fundraising. Visit the website HERE. 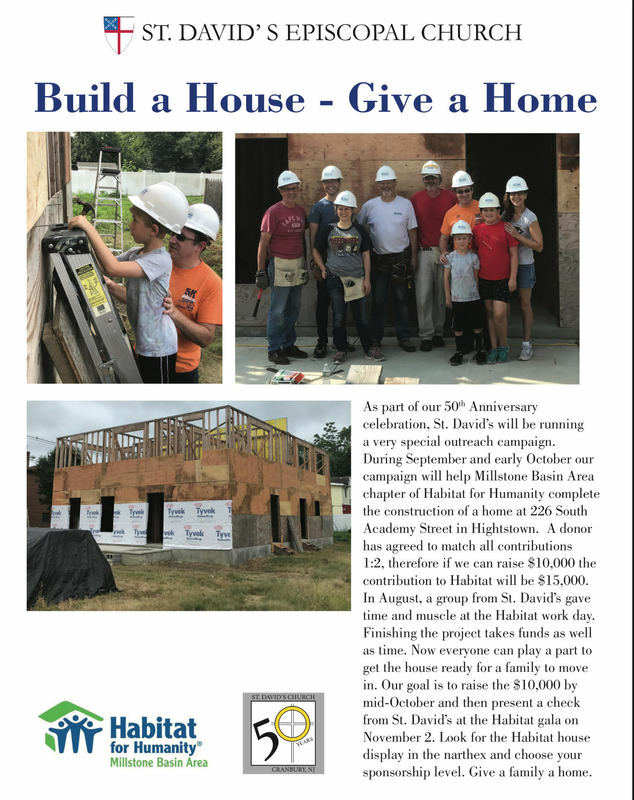 St. David’s and other churches in the area have entered into a partnership with Habitat for Humanity to help construct a home in the Hightstown area. In addition to funding support, participating churches will provide volunteers to give hands-on help with construction. St. David’s supports the NetsforLife campaign. This project, whose sponsors include Episcopal Relief & Development, provides mosquito nets and education on how to use them in 17 countries in sub-Saharan Africa. The nets provide protection from mosquitoes that carry malaria. Each net costs $12, and we surpassed our goal of raising the money for 100 nets in 2012. This group works tirelessly making hats, scarves, prayer shawls, and lap and baptism blankets. The items are given to new babies, sick persons, such as cancer patients at local hospitals, and the Seaman’s Church Institute, which distributes hats and scarves to merchant seamen. Members meet a couple of times a month, during the day, at the church. During the Advent season, St. David’s supports Christmas gift drives run by two area organizations. Enable, a ministry for persons with disabilities, provides a list of specific items requested by its residents. Rise, a program that assists children from less privileged families, asks for new or gently used toys, as well as food items and gift cards. There is an overwhelming response from parishioners every year. Each year, parishioners collect toiletries, snacks, personal items, and phone cards for the Seamen’s Church Institute. These items are given to merchant seafarers who are far from their families at the holiday season. The gift items, and the hats and scarves made throughout the year by the Prayer Shawl Ministry, are presented to SCI representatives at an International Dinner held at St. David’s.